“If you build them, they will come.” Fairies, that is. And gnomes, trolls, elves and other creatures said to inhabit the natural world. That’s the idea behind building tiny whimsical houses in the woods. And Malden is now prepared to welcome these creatures with a full selection of residential units. 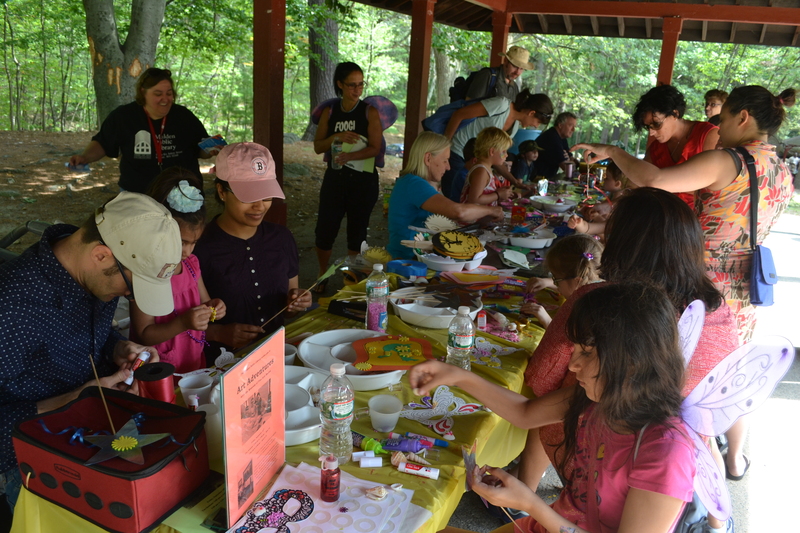 On Saturday, August 29, Pine Banks Park on the Malden/Melrose line was host to Malden’s first Fairy House event organized by Ward 5 Councilor Barbara Murphy in collaboration with Malden Reads. The event was attended by families and community members of all ages. Murphy says the event was inspired by the Fairy House Series of books written and illustrated by Tracy Kane. Building tiny houses for nature’s mythical creatures is an art that some say started on islands off the coast of New England and then spread throughout the country. 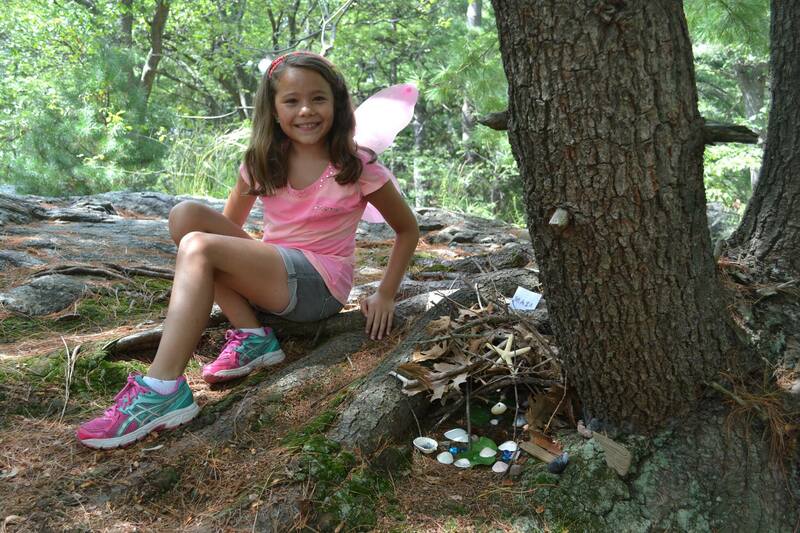 Maia, age 10, next to her fairy house. 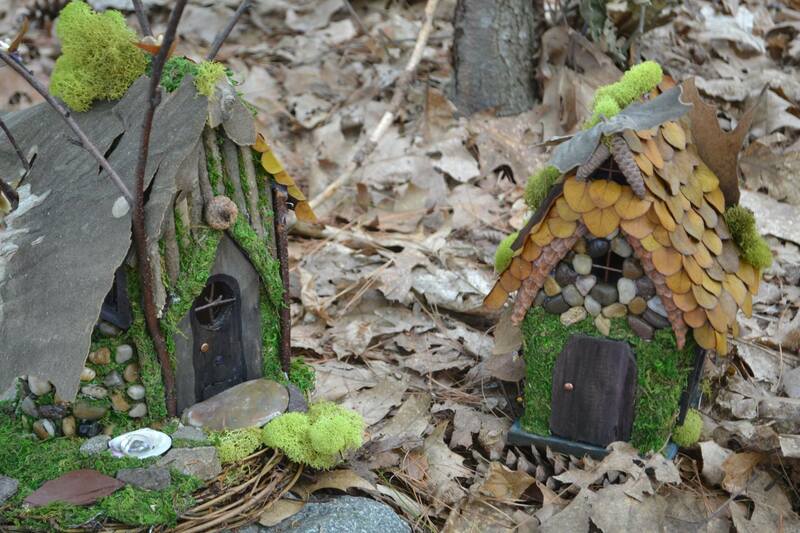 Many community groups pre-built fairy houses which were placed along a walk leading through the woods and up a hill. 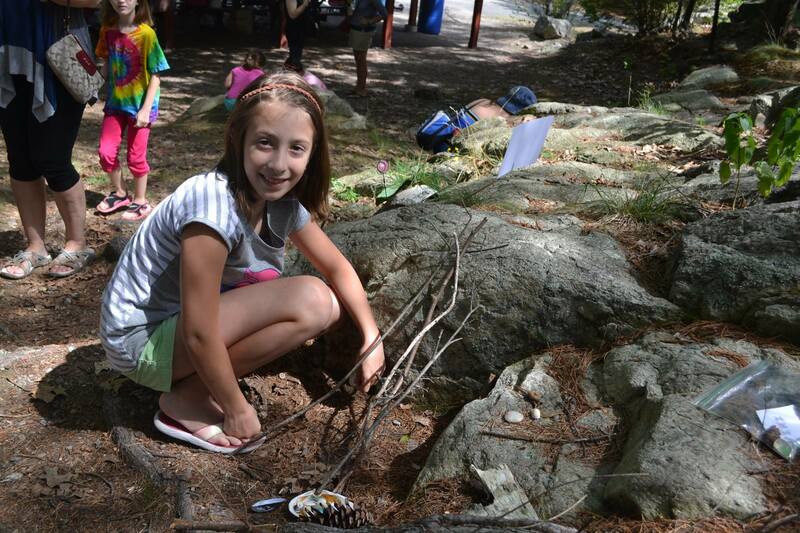 On the day of the event, children and families built houses with natural materials found in the woods or provided through a “Builder’s Workshop” table—donated leaves, flowers, twigs, bark, shells, stones, pine cones, acorns and other gifts from nature. Local artist and resident Paige Willis pre-built these twin houses for the event. Viki, age 10, next to her fairy house. Community groups and individuals joined in on the creative fun. 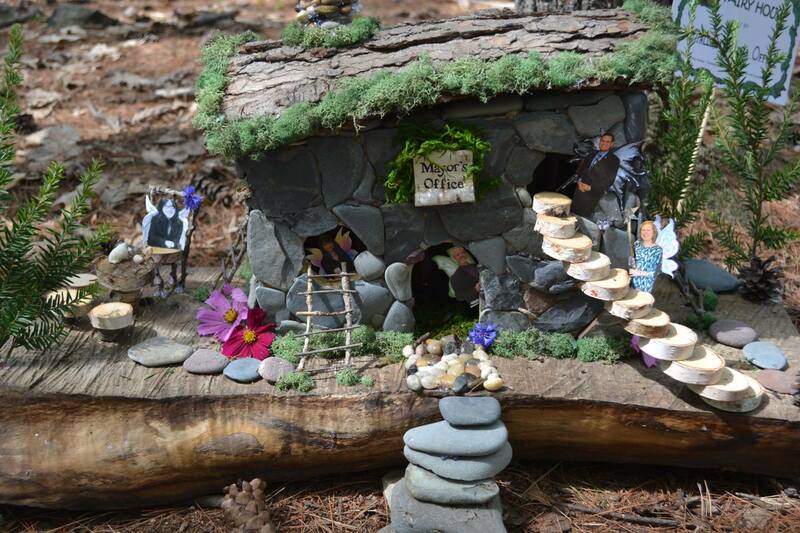 Fairy houses were built by the Mayor’s Office, featuring cut-out faces of the mayor’s staff, and the Malden Public Library built a house filled with little books. Malden Reads collaborated with the Chinese Culture Connection to build an “East Meets West” house constructed of both bamboo and pine bark. FOOGI (Friends of Oak Grove, Inc.) built an elaborate Swiss Family Robinson-style treehouse complete with ladders, bridges and swings and set in a little village of smaller houses. 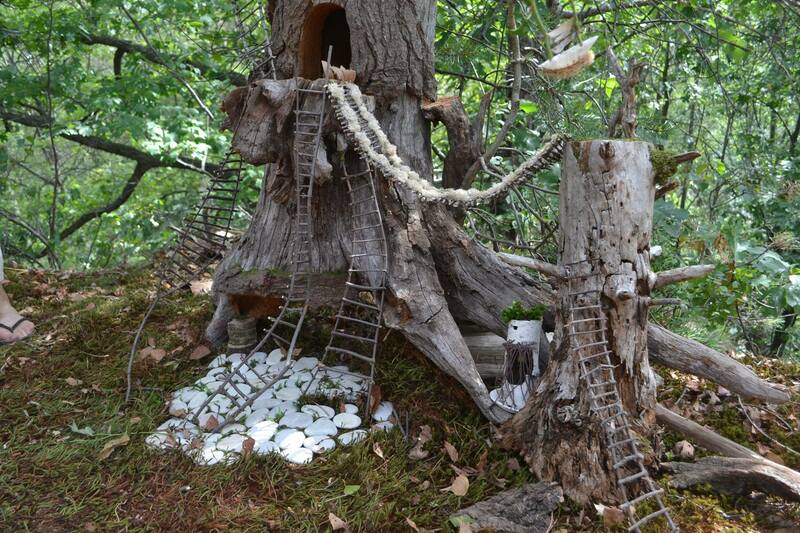 FOOGI (Friends of Oak Grove, Inc.) pre-built the pieces of their intricate tree house. “It was all about community,” says Pat Hayes, a member of FOOGI. “We built a little community and we all got together to over a period of a few days to create it.” Karen Colon Hayes says their families collected all the materials directly from Pine Banks Park to make their Fairy House, even though the construction was done off-site. “Everything is locally sourced,” she claims. 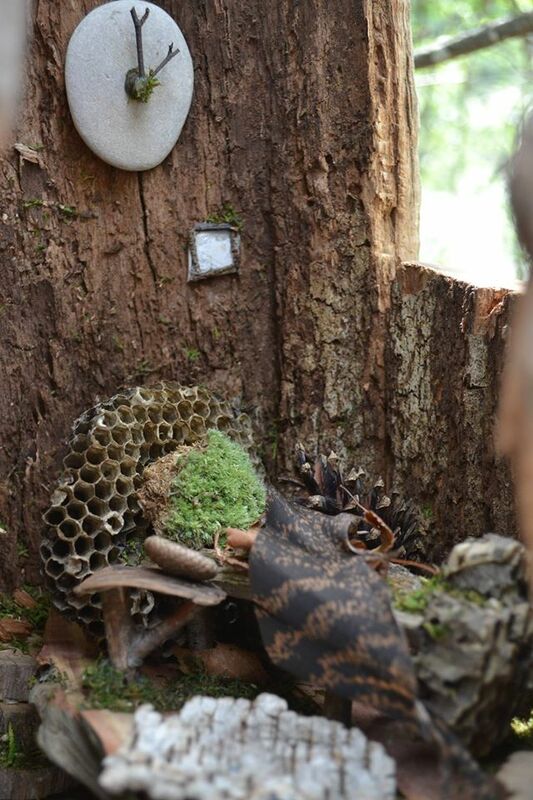 A peek inside the FOOGI fairy house reveals a clock on the wall and a little bed using honeycomb as a headboard. Murphy says that she wanted to create an event that connected kids with nature, was fun for the whole community, and that highlighted the beautiful natural resource that is Pine Banks Park, located in Ward 5. She partnered with Malden Reads: One City, One Book which helped publicize the event as part of their series tied in with the 2015 book selections. This year’s Malden Reads theme was about technology and comparing old ways of doing things with how they are done in the digital age. “Technology is useful, but we all could use a break from technology and a chance to connect with the natural world,” says Malden Reads co-facilitator Jodie Zalk. In the main book selection “Mr. Penumbra’s 24-hour Bookstore,” the main character’s roommate was always constructing something creative and beautiful with real materials. This beautiful circular stone structure was pre-built by Alyssa Hall. 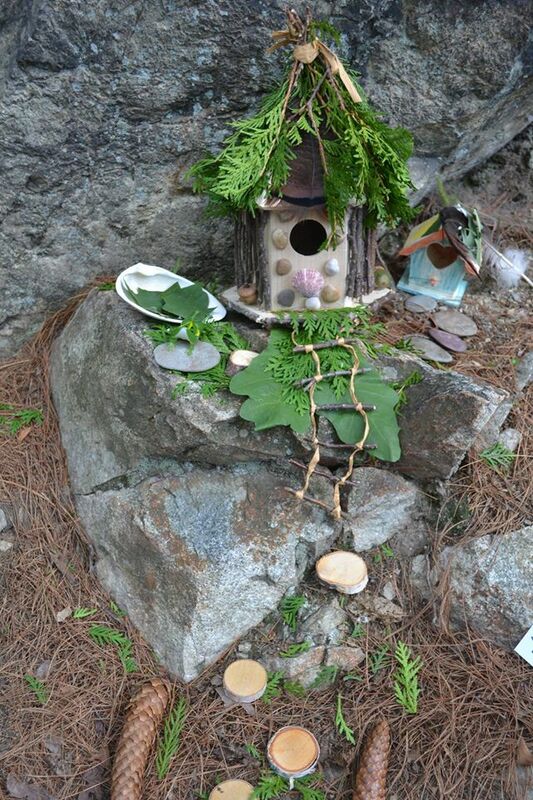 All fairy houses constructed that day received an official builder’s certificate. 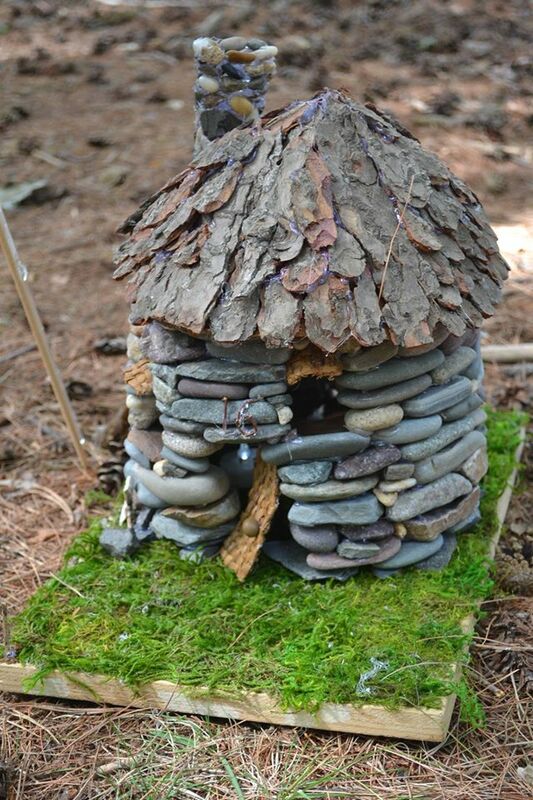 Prizes were awarded to the best pre-built fairy houses, based on both creativity and the use of natural materials. The judging panel’s first place and the People’s Choice award went to the house constructed by FOOGI. Local artist Paige Willis won second place and Alyssa Hall won third. The Mayor’s staff is on hand to greet the fairies inside the tiny office. Local resident and artist Kari Percival came with her Earthworm Pie Puppet Theater to delight audiences with an interactive puppet show during the day’s event. To round out the day’s activities, Library Director Dora St. Martin read fairy and nature stories aloud and librarian Cathy Bartlett (also a Ward 5 resident) led an arts and crafts table for kids. 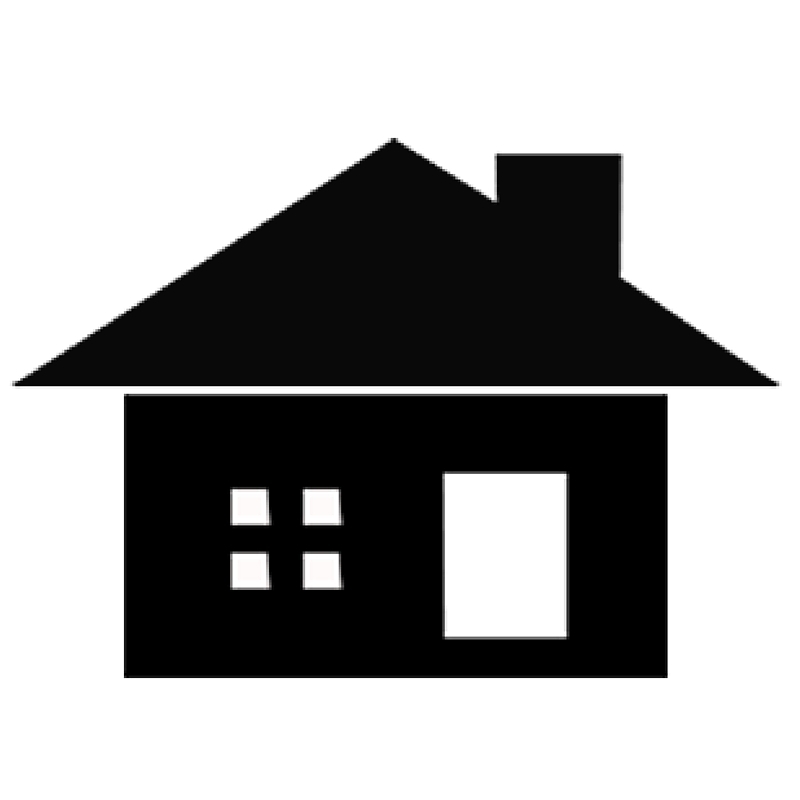 Barbara Murphy wishes to thank the Jefferson Apartment Group and The Brennan Group for their donation to fund expenses for the event. Children got to write inside the tiny books that line the shelves inside this fairy library. I think the fairies would agree. Video: Luna and Ellie take you on a tour of their fairy house. Video: Owen and Oren worked with alongside their families to construct a variety of shelter options. What a special day this was for Malden. 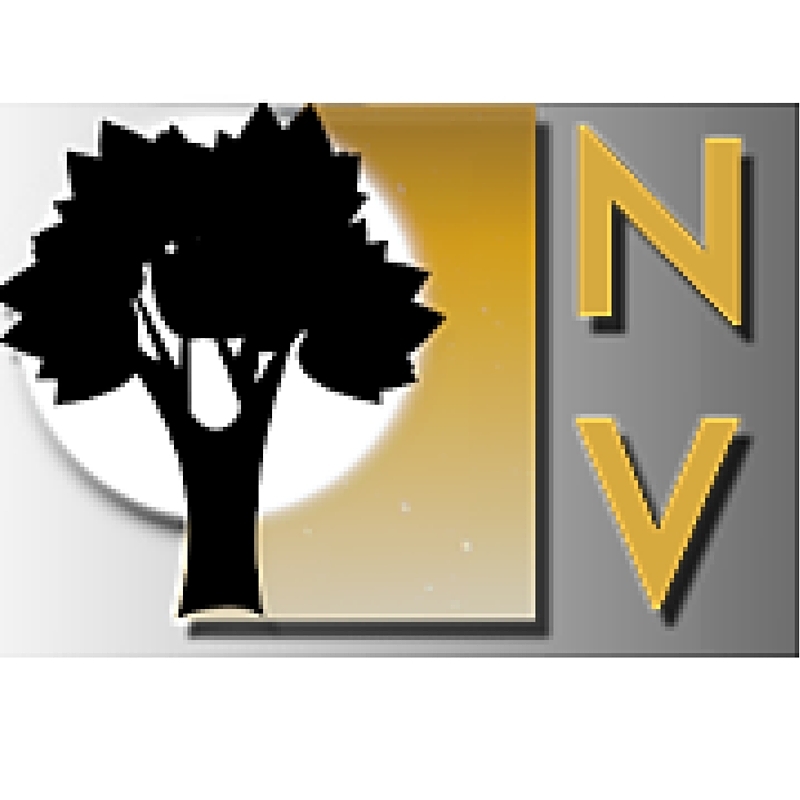 Thank you for capturing the spirit on Neighborhood View! Great story … the videos made made me smile. Very nice. Sorry I missed it. Nice photos and video. The sense of community was well displayed in the story. This was a amazing event! we felt like we went to another time and place and were in fairyland. Thank you so much! Beautiful story and photos, Anne. It’s great that Malden’s fairies are finally being acknowledged!